This intuitive DIY guide shows how to wire, disassemble, tweak, and re-purpose household devices and integrate them with your Raspberry Pi and Arduino inventions. 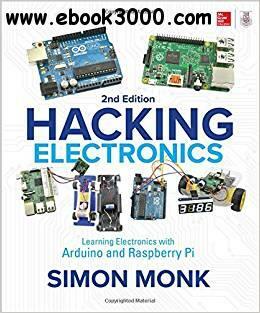 Packed with full-color illustrations, photos, and diagrams, Hacking Electronics: Learning Electronics with Arduino and Raspberry Pi, Second Edition, features fun, easy-to-follow projects. You'll discover how to build an Internet-controlled hacked electric toy, ultrasonic rangefinder, remote-controlled robotic rover, audio amp, slot car brakes and headlights-even a smart card reader!